For readers of Lucinda Riley, Sarah Jio, or Susan Meissner, this gripping historical debut novel tells the story of two women: one, an immigrant seamstress who disappears from San Francisco's gritty streets in 1876, and the other, a young woman in present day who must delve into the secrets of her husband's wealthy family only to discover that she and the missing dressmaker might be connected in unexpected ways. Immigrant dressmakers Hannelore Schaeffer and Margaret O'Brien struggle to provide food for their siblings, while mending delicate clothing for the city's most affluent ladies. When wealthy Lucas Havensworth enters the shop, Hanna's future is altered forever. With Margaret's encouragement and the power of a borrowed green dress, Hanna dares to see herself as worthy of him. Then Margaret disappears, and Hanna turns to Lucas. Braving the gritty streets of the Barbary Coast and daring to enter the mansions of Nob Hill, Hanna stumbles upon Margaret's fate, forcing her to make a devastating decision...one that will echo through the generations. In her elegant Marina apartment overlooking the Golden Gate Bridge, Sarah Havensworth struggles to complete the novel she quit her job for. Afraid to tell her husband of her writer's block, Sarah is also hiding a darker secret—one that has haunted her for 14 years. Then a news headline from 1876 sparks inspiration: Missing Dressmakers Believed to be Murdered. Compelled to discover what happened to Hannelore and Margaret, Sarah returns to her roots as a journalist. Will her beautiful heirloom engagement ring uncover a connection to Hanna Schaeffer? Sarah Schmidt Havensworth is struggling to complete her MFA degree. The novel she's working on is not coming together and Sarah doesn't want to tell her husband or her academic advisor. Then Sarah has a spark that quickly becomes an inner fire when she reads about two immigrant women from the late 19th century. Sarah finds herself pulled to find out the truth behind this missing and presumed dead women from over a hundred years in the past. Little does Sarah know that this story has ties to her husband's family past and there are some secrets that are best kept in the dark. The Dressmaker's Dowry is told in alternating voices of Sarah Havensworth and Hannelore "Hanna" Schaeffer. Hanna is a hardworking seamstress struggling to provide for her younger siblings and avoid the physical abuse heaped on them all by their alcoholic father. When Hanna's father becomes abusive to the point of serious injury Hanna does the only thing she knows to do and that's run. She takes her younger siblings and leaves, but she refuses to leave town until she knows the fate of her missing friend and co-worker Margaret. The only person she knows that might help her is Lucas Havensworth, the only wealthy customer that ever treated her as a fellow human being worthy of kindness instead of as a lowly servant deserving scorn and ridicule. Not only does Lucas help Hanna with her search for her friend, but he takes Hanna and her siblings to his family's home and offers refuge. Will they be able to find the truth about Margaret before she becomes a victim of the rampant crime in town? Sarah's journey is to seek the truth about these two missing women, be there for her friends, and be supportive of her husband's growing business. The more Sarah learns about Hanna, the more she realizes that Hanna may have close ties to her husband's family. She also must quietly contend with threats against continuing to seek the truth about what happened to Hanna and Margeret. Will she be able to reveal the truth about Hanna and Margaret without having her secrets revealed? Will that secret be the death knell for her marriage? I found The Dressmaker's Dowry to be a fast-paced and engaging read. I enjoy reading stories that combine contemporary and historical storylines and Ms. Jaeger has done an admirable job with Hanna and Sarah's stories. The author provides the reader with glimpses into the past, especially the lives of immigrants in an inhospitable environment. That storyline is nicely melded with the contemporary storyline that includes social entrepreneurship on the part of Sarah's husband Hunter Havensworth, who has a clothing company that offers free clothing to the homeless for every clothing item sold. Both storylines focus on the haves and the have-nots in society and how many of the "haves" talk a good game about raising funds and awareness for the "have-nots" but don't want to get their hands dirty by actually dealing with these people. Yes, there's a lot more going on in the story than just missing women and social entrepreneurship, there's child abuse, poverty, family secrets and the lengths people will go to just to protect those secrets, and romance. 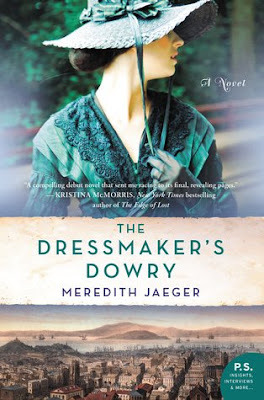 If you enjoy reading historical fiction or stories with a realistic bent, then you'll definitely want to add The Dressmaker's Dowry to your TBR list. I look forward to reading more from Ms. Jaeger in the future.